1. Gather yoghurt and pop sticks. 2. Using a sharp knife cut a small slit in the centre of the lid of each yoghurt pot. 3. Push a pop stick in each lid. Place in the freezer and freeze overnight. 4. When frozen, squeeze the sides of each pot to release the ice blocks or dip the pot in warm water to release. You can use any brand of small yoghurt pots for this recipe. 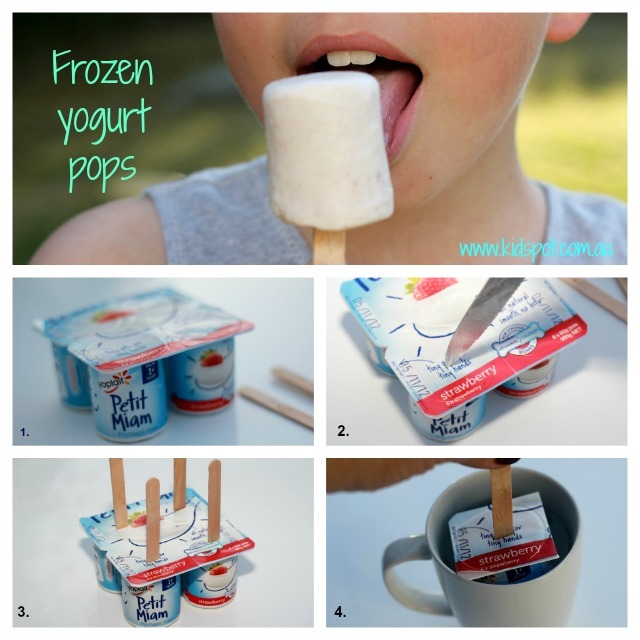 If you are looking for a budget version of this recipe, you can use smooth yoghurt poured into ice cube trays and push halved pop sticks into the trays when the yoghurt is semi-frozen.